The hallmark of any job-shop metal-stamping facility has got to be flexibility—the ability to fit production capabilities to most any job that comes down the pike. While few shops can afford to no-bid too many projects these days, at the same time capital dollars are more precious than ever. That combination of factors has job-shop stampers looking hard at fully utilizing every minute of available press time. Nothing could be truer for the 50,000-sq.-ft. plant of Great Lakes Metal Stamping (GLMS), located in Cusseta, AL. 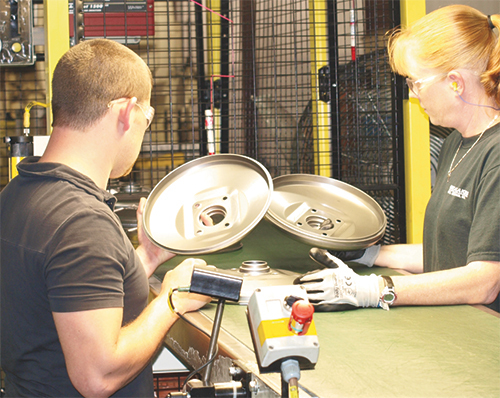 GLMS, primarily a Tier Two and Three automotive and appliance OEM supplier headquartered in Bridgman, MI, opened its southern plant in 2007 to serve one customer—Benteler. It’s since developed an impressive knack of infiltrating the supply chain for the region’s automotive and appliance manufacturers. Case in point: the plant recently took on a big project supplying 30,000 stamped parts per week to Tier One automotive supplier Mando America Corp., in nearby Opelika, AL. One Big Transfer Press, or an Automated Press Line? 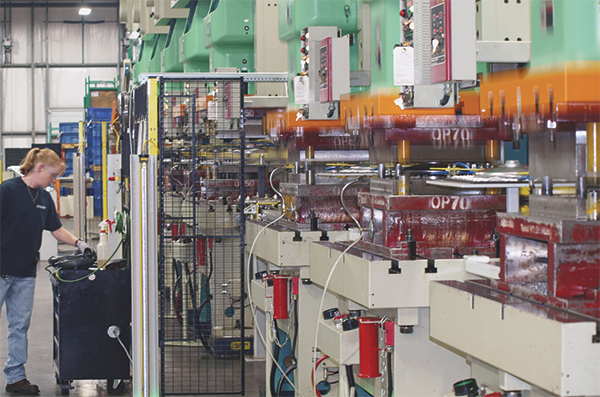 The nine-press transfer line at Great Lakes Metal Stamping features two walking-beam transfer units (AP&T Monobar 80 units)—one links the first five presses in the line (far left) and a second links the last four presses in the lineup. In between (and where the press operator stands in this photo) is an AP&T Shuttle that moves stampings between the two transfer bars. Here it’s shown guarded by fencing. Watch it run. The project in question required GLMS to produce three stampings that Mando assembles into brake boosters for a variety of vehicle platforms. Early in 2012, GLMS president Keith Hettig assembled a team to review its options for stamping the parts. They immediately dismissed progressive dies, he says, because two of the stampings required a hemming operation. So, stamping the brake-booster parts boiled down to either investing in a huge transfer press, or in a series of smaller presses linked with automation. The latter concept won out, after Hettig and the team took a close look at costing, and of course, the goal of optimizing flexibility to position to press shop to be able to take in additional work. The nine-press line and its automation equipment (supplied by AP&T) landed at the GLMS plant in July 2012. Featured are nine Seyi mechanical presses—a 275-ton lead press followed by eight 220-ton presses. All sit at the same die height to allow the AP&T walking-beam transfer system (two Monobar 80 units, and an AP&T Shuttle) to easily index stampings down the line. The equipment sits in a new 15,000-sq.-ft. addition on the back of the plant. 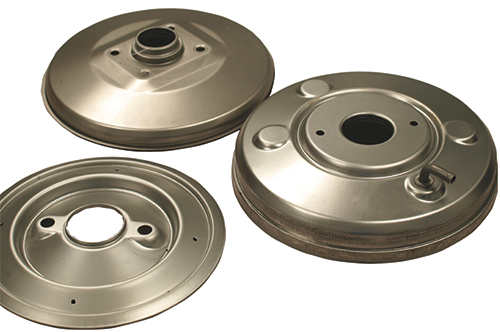 The walking-beam transfer line makes these three brake-booster stampings—front and rear covers, and a diaphragm plate (bottom left). Twenty percent of the front-cover stampings are for turbo engines, and require GLMS to add a weld nut and welded tube to the part (right). At the end of the line, press operator Kristi Pruitt and plant engineer Ben Jones visually inspect stamped parts for burrs and blemishes. The shuttle mentioned by Gruber is an AP&T automation device that sits between presses five and six; the Monobar units link presses one through five, and six through nine. An exit conveyor rides on casters to easily move from the end of the line to between presses five and six. Monobar 80 specs, per AP&T: 39-in. x-axis travel and 8-in. z-axis travel, with a maximum weight capacity of 176 lb. The units mount directly to each press frame. Complete transfer-line control rests on the shoulders of a Siemens control; cam switches on each press control trigger on-off pulses of lubrication nozzles plumbed sporadically throughout the line, depending on the die arrangement. Each press boasts a Wintriss tonnage monitor. Sensors on the transfer mechanisms look for verification of part presence and vacuum pressure; light curtains guard the front side of the complete 105-ft.-long line. The press line runs at 16 strokes/min. to supply Mando with 10,000 of each of the three stamped parts weekly. That has GLMS changing out the line every 1.5 days, “a 90-min. process that includes changing out the Monobar transfer racks (equipped with vacuum-cup grippers),” explains GLMS general manager Joe Sikes, “and changing out the dies.” Die store on nearby racks and move quickly onto and off the presses via rollers and locating pins on the bolsters. Asked if automating the brake-booster job posed any unique challenges, project manager and plant engineer Ben Jones noted a little tweaking required to take the job from an initial run rate of 8 strokes/min. up to the specified run rate. Jones managed the project from its inception, over a 20-week period. “Ordering the presses from Taiwan (Seyi, with U.S. operations in Tullahoma, TN), the automation from Sweden (AP&T, with U.S. headquarters in Monroe, NC) and the tooling from China,” says Jones, “challenged us to get everyone on the same page, and share specs. In particular, we weren’t able to provide detailed drawings or specs for the transfer equipment to our tooling source. That required us to make some adjustments to the tools to allow the transfer system to properly locate the stampings as they go to pick them up and move them station to station. See also: AP&T North America Inc., SEYI America, Inc. I don't even know the way I finished up here, however I believed this submit was once great. I do not know who you're but definitely you're going to a well-known blogger in case you aren't already. Cheers!